Improved version of Model 1940 kit with all parts needed for the F-34 gun; again, mimics its 1/35 scale "big brother"; wheels are an amazing accomplishment in injection molding; decal sheet now applies! Didn't come out when I was building 1/72 armor kits! The T-34 Model 1940, and the even better Model 1941, were a major shock to the Germans when they invaded in June 1941. This tank was the work of the legendary designer Mikhail Koshkin, who unfortunately died before he got to see his creation validate itself before the Soviet government and the world. Companies like DML need to be aware that the Soviets never called these "T-34/76" tanks, as that was a German description and did not come into being until the 85mm tanks appeared in 1944. In point of fact, many Soviet era documents show that the tanks were only differentiated by their number of turrets (as with the T-26) or gun carried (here either L-11 or F-34). The Soviets did dub later tanks T-34-85 to show the differences. 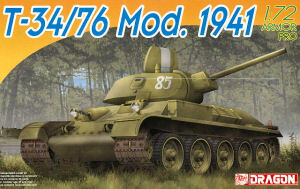 DML has now added the more widely built Model 1941 (T-34 with 76.2mm F-34 gun) to its "Armor Pro" series (a select part of its 1/72 scale series with additional parts, different moldings, and extras included in the kits). The kit retains the welded turret of the early T-34s and does not yet provide a cast turret for the more widely produced late Model 1941 with longitudinal grilles. Like the Model 1940, it follows the design of their 1/35 scale kits, and again DML has managed to shrink the level of details down and at the same time compact the number of parts by some clever molding tricks. One of the most impressive tricks is the use of what DML calls "slide-molding" in which multi-part molds with moving parts are used vice the older "sandwich-type" two piece molds. As a result, they can do larger pieces without either ejection pin marks or sinkholes, and get depth or undercuts in smaller parts. This shows up in this kit in two areas: first, the fact that even in this scale the gun barrel for the F-34 cannon has a hollow muzzle as molded; and second, the wheels come in 14 ready-to-install assemblies vice 28 separate wheels and perhaps axle caps. The wheels are nicely done, with a nice deep grove in between (unlike another company's 1/72 scale kits with solid road wheels or most HO scale armor) and detailed on both sides. Purists will want to drill out the thin flash in the drivers (parts C2) and idlers (parts C1) though, but that is an easy task if you have a pin vise and small drill bits. The hull comes with the correct early T-34 (Model 1940/early Model 1941) hull with vertical grille openings in the radiator intakes and a choice between either a solid radiator exhaust grille or one with an etched metal grille instead. This is the same nice touch now offered in the 1/35 scale kits, and DML is to be congratulated for providing it in 1/72 as well. Most of the details parts are crisp and well done as well, but the twin jacks for the tank are provided as one part (A63) and are probably the least well done of any component. The kit comes with an absolutely gorgeous sheet of decals with many patriotic sayings and markings, but as the original sheet with the Model 1940 was more suited to the Model 1941, most of them are now quite useful. However, many early production Model 1941s carried no markings (they weren't around long enough to do that) so care must be taken in using the decals. Three basic tank finishes are shown: one "protective green" with numbers from early 1942; one in winter scheme with the famous "tire tracks" camouflage; and the 130th Tank Brigade from the 21st Tank Corps, with another 12 options shown for use of slogans on turrets. Again, you may want to get photo references as many of these, from what I recall, went on cast turret tanks. Overall, based on its continued excellence from the Model 1940, this is a real winner.